You’ve taken the first step towards a new and better way of living. 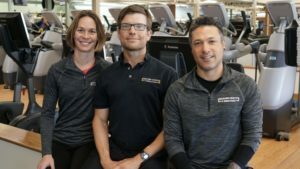 Dodi, Jason, and Robbie are exercise physiologists and skilled fitness experts. They have one mission: to help you live the life you know you want to live, as healthy, as happy and for as long as possible. Yes, You can take control of your life and health through education, motivation and exercise. Give us 60 days: We’ll give you the rest of your life! A program – unique in its approach and specifically tailored to your needs. $60 for 60 Days: An introduction to exercise for people just like you. Start to take control of your health through education, motivation and exercise! What makes it work? The $60 for 60 Days program is unique in its approach. Your experience will be specifically tailored to fit your individual needs. In addition, you will exercise in a comfortable, quiet environment called Wellness Central which is designed and reserved for people who are new to exercise. We believe that if you feel comfortable while exercising, you are more likely to enjoy it, and as a result, more likely to keep doing it! Our goal is to help you! Gradually build a healthier lifestyle little by little, one workout at a time. Get Started! As the name indicates, the program only costs $60 for 60 days! We only ask you to commit to two, scheduled, thirty-minute workouts each week. To ensure an optimum experience, we ask for a referral letter from a medical professional who is part of your healthcare team. For your safety, all exercise is prescribed and supervised by members of our Exercise Physiology staff. Each staff member has a college degree in exercise science. This means a skilled fitness expert will guide you through a safe exercise routine. Nutrition services are also available to you but participation is not required. As a member of the $60 for 60 Days program, you have access to the entire Dedham Health and Athletic Complex including the indoor track, salt pure pool, and all of our group fitness classes.